Just last week we had conducted a fact-check on the “fact-check” of The Telegraph, which is a group concern of the news channel ABP News. A few days back, ABP News too had started a series based on fact-checking stories. It was called “Viral Sach”, a series which would check stories circulating in social media , for authenticity. 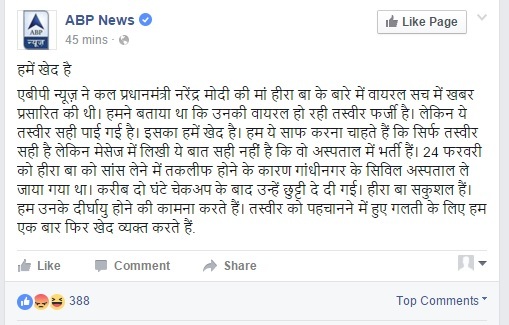 And today, this “fact-checker” of ABPNews too was found peddling blatant lies. 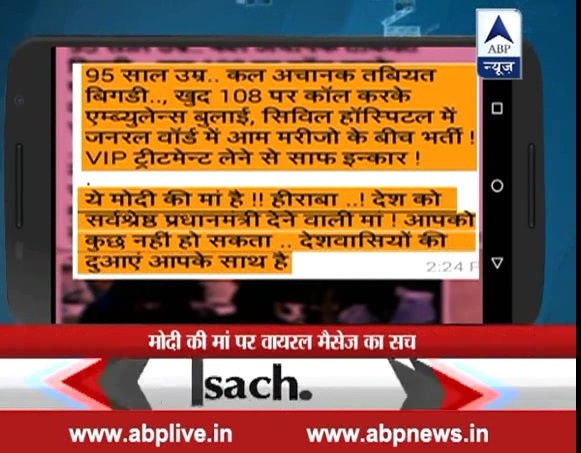 ABP News clearly claims that after their “investigation” they found out that the photo was not of Modi’s mother. 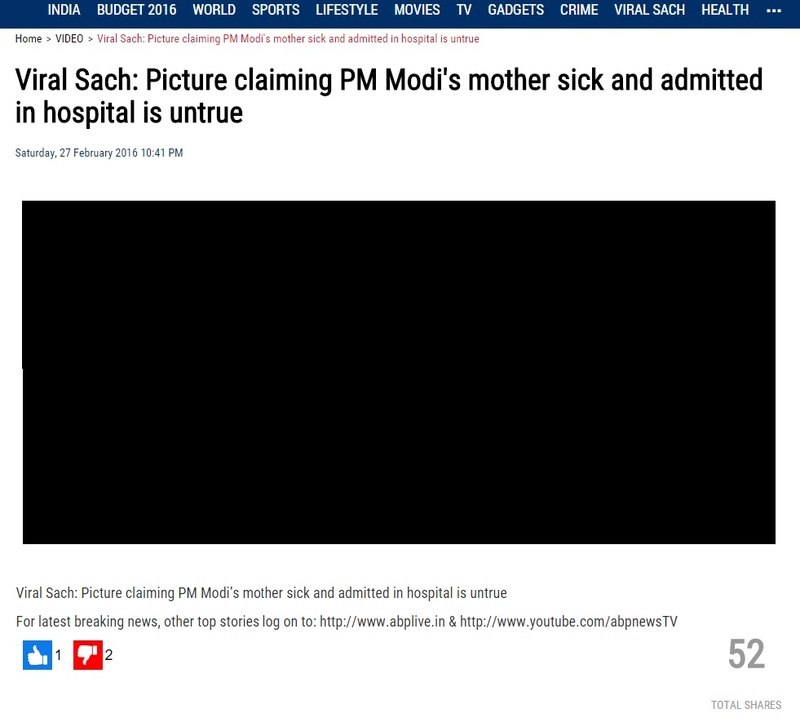 They admit that Modi’s mother did go to the hospital but claim the photo of some other woman was circulated by some mischievous element. Obviously, such a big “fact-check” made quite a bit of news on social media. And when something makes news on social media, it is subjected to scrutiny. As do many claims by media, this claim to did not stand the scrutiny of the same social media it tried to debunk. He proceeded to provide various proofs like a cutting from a local news paper and more photos of the same incident. The apology though was not unconditional. They admitted that the picture was indeed of Hiraben, Modi’s mother, but claimed that the whatsapp message along with the picture was untrue. As can be seen from the video, ABP News had earlier only claimed that the picture was untrue and made no claims about the message. Now, in the apology, goalposts were being shifted. Now ABP News began claiming that the message was untrue. ABP News now claims that contrary to what the message claims, Modi’s mother is not admitted in the hospital as of now, but was discharged within 2 hours on 24th February itself. If ABP News is now trying to say that since (according to them) she was discharged within 2 hours, it does not mean she was admitted (bharti), then this is indeed a pathetic attempt to somehow brazen it out and hide behind semantics. Is it too much to expect from media that they will understand that a 95 year old woman who is having trouble breathing may have to admitted, even if it is only for a few hours? ABP News clearly claimed that the photo was fake, that has been proved to untrue. It would have been more decent of them to have admitted this mistake and moved on, instead of trying to apologise and simultaneously shift the attention to a new purely technical issue.